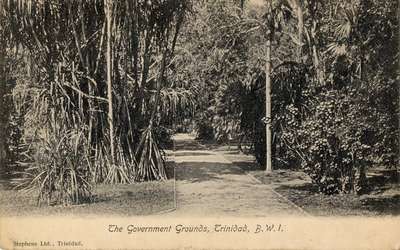 The Government Grounds, Trinidad, B.W.I. A postcard of the Government Grounds in Trinidad from L.G.F. to Mrs. Robert Layton, San Fernando, T'dad. "Sorry I won't be able to make a call on Good Friday, but expect people I know from Demerera on that day. Expect to go to the Islands on Saturday until Tuesday. Hope you and Bob are both well. I enjoyed my little very much and hope I'll be able to get down again before Xmas eh?